Can somebody tell me what in the hell horror filmmakers have against snow? While most horror films tend to set their stories during the summer and fall seasons, I’ve always found one of the most underrated seasons to be winter. There’s just something about bitter cold and endless stretches of white that leave me feeling emotionally drained, not to mention claustrophobic; seems like the perfect weather to shoot horror in. To be sure there are a few out there, some of my favorites include THE THING (1982), THE LAST WINTER (2006), ANTARCTIC JOURNAL (NAMGEUK-ILGI, 2005) and Hammer’s THE ABOMINABLE SNOWMAN (1957), but “few” is the keyword. I suppose there’s always the never-ending procession of Christmas horrors to choose from, they usually have snow, but most don’t use it to their benefit. Even less feature zombies. 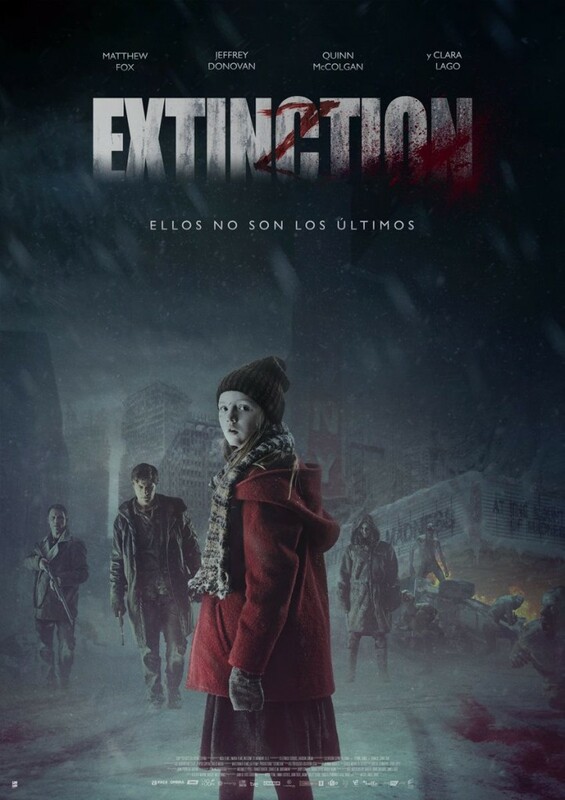 Miguel Ángel Vivas’s EXTINCTION, adapting Juan de Dios Garduño’s novel Y Pese A Todo… (And Despite Everything…), not only gives us a horror film set during what appears to be a nuclear winter, but we get zombies as well. Excepcional! The films opens to a busload filled with armed soldiers and visibly frightened civilians arriving at a military base, fleeing an unseen danger. The safety they sought with the goverment never materializes though as the danger, revealing itself to be flesh-eating zombies, boards the bus looking for their next meal. A panic ensues as people desperately clamour over one another in an attempt to reach the emergency door, this is where we’re first introduced to Patrick (Matthew Fox), Emma (Valeria Vereau), baby Lu (Emília Gresicki, later played by Quinn McColgan) and Jack (Jeffrey Donovan). Nine years later the world is now covered in snow and Jack & Lu live next door to Patrick, though the men are clearly estranged. During the long days cooped up inside, Jack tries to maintain some semblance of normality for Lu, which includes teaching her arithmetic and geography. Next door, Patrick spends his days scavenging for food, getting drunk with his dog and broadcasting rants and music all night long over his CB radio’s loudspeaker. While out on a food run, Patrick happens upon what both he and Jack had assumed died off from the cold years prior…a zombie! Unlike the ravenous monsters they’d previously encountered, these new zombies had adapted to the environment, evolving into ferocious creatures that no longer relied on sight but sound. They heal faster, move quicker, camoflage with their surroundings and have even developed rudimentary communication allowing them to hunt as packs. With the zombies back in full force, Jack and Patrick must bury the hatchet for Lu’s sake and work together to survive the night and escape the icy wasteland they call home. EXTINCTION focuses on its characters and takes its time, never rushing the reconciliation we know will eventually arrive and leaving things vague enough for us to fill in the blanks as to what went so wrong between the two friends. HINT: It was a woman. It’s always a woman (not a spoiler). Fox’s Patrick, delivered positively insane, and Donovan’s doting father play off one another well, creating—for awhile—an (unfunny) Odd Couple-esque duo, once the walls between them come down. Until that point though, the tension occasionally becomes unbearable. Lu, played by the super talented Quinn McColgan, melts the heart with her innocence and thirst for life. I love it when a film has characters I can really invest myself in. Not so fast, I did have a small gripe or two about the film. The first issue I had was a few questionable VFX/CGI sequences that really cheapened things a bit. During a snowmobile ride in the beginning, it was obvious we were looking at some digital tomfoolery at work. We see it again later, during a zombie attack. These were noticeable enough that I kept thinking, “Now why didn’t they just snip that second or two out?” I’m not editor, but I know the best VFX/CGI is the kind you don’t notice. My second gripe was the predictability of the story. While I liked it, I was disappointed to see some tropes, like the “self-sacrifice scheme” and “cue the sun.” The film goes exactly where it should, there are a few twists and turns, but for the most part is plods forward to exactly where we expect it to go. Which can be both satisfying and a letdown. For me, overall, the film was entertaining and the acting pitch perfect. No major complaints. I went into EXTINCTION looking for something unique, and that’s exactly what Vivas delivered. This wasn’t your average zombie film and I can appreciate that. I found the winter setting delightfully disorienting and isolating, which added to the tension, and the evolved zombies—they slightly resembled the crawlers from THE DESCENT—looked superb. This was the kind of film I’d settle in for again. Hope you all enjoy it as well. Brian Harris has authored nine books, including Filmbrawl,Gimp 1-5 and Gimp: The Rapening 1-3. 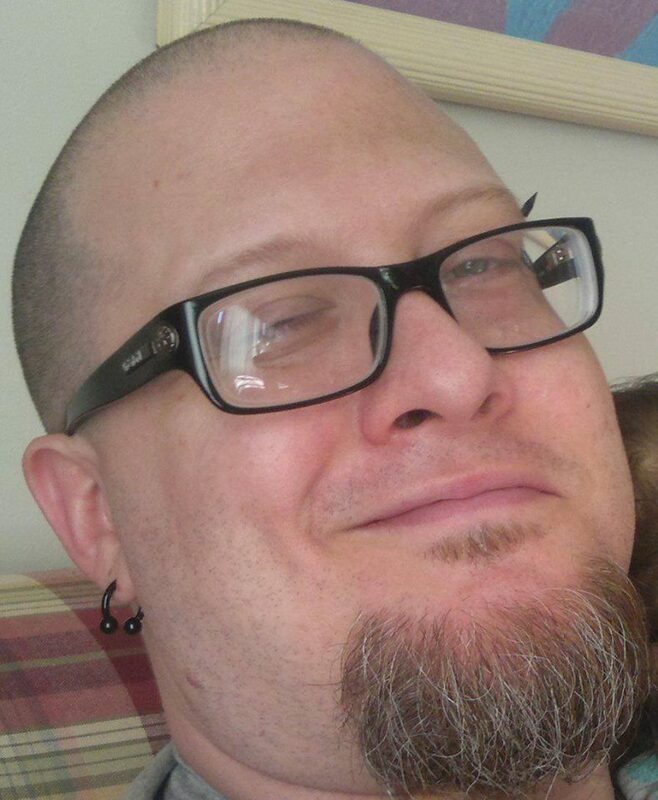 His work has also been featured in the horror fiction anthology Masters of Taboo: Cannibalism and magazinesExploitation Retrospect, Gorezone Magazine (UK), Ultra Violent Magazine,Serial Killer Magazine, and Hacker’s Source Magazine. He also regularly writes for the award-winning horror/cult cinema magazine Weng’s Chopand the revival of Tim Paxton’s Monster! Magazine, both of which he publishes and co-edits.